550 Kgs of Beach Trash Combed in 3 Hours! 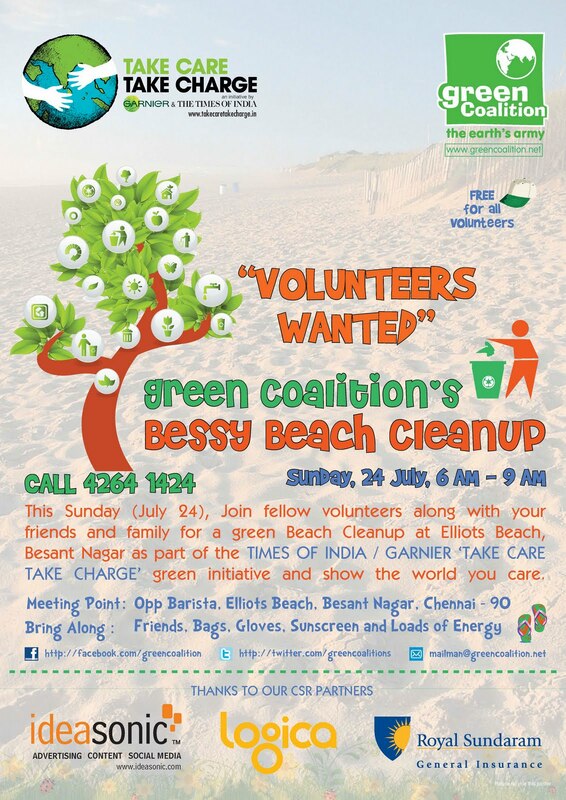 Green Coalition Network partnered with Times of India and Garnier for the "Bessy Beach Cleanup" on July 24, 2011. This was the only officially endorsed "Take Care Take Charge" environment day event in Chennai, India and was held at the Elliots Beach in Besant Nagar between 6 AM and 9 AM. More than 500 volunteers across different age groups participated in the Beach cleanup. This included school and college students, corporate staff, beach patrons besides members, interns and volunteers of Green Coalition Network and other NGOs which ensured the clean up was a great success. A special mention to the AVM Rajeswari School since they enthusiastically contributed over 200 students for the cleanup besides the CSR sponsors - Logica, Royal Sundaram Insurance and Ideasonic Studios. Armed with protective hand gloves, caps, recyclable trash bags and jute sacks, each of our volunteer removed an estimated one KG each of trash from the beach sands, the shore and the beach roads. Some of our more active volunteers individually collected over 5 kgs each! Plastic, paper, cigarette butts, straws, thermocol, styrofoam, footwear, glass, food wrappers, metal objects, wood chunks besides odd surprises like broken helmets, old tires, floppy disks and a significant amount of clothing trash were combed from the beach area. Approximately 550 Kgs of trash and marine debris was collected, brought to the shore and kept aside with regular garbage for collection by the Chennai Corporation conservancy dept. This is an impressive achievement considering the cleanup started before sunrise with an inclement rain soaked weather the previous night and some of our volunteers being absolute first-timers. Awareness lectures and distribution of leaflets were also organised for the benefit of the student volunteers and the local citizenry at the beach. This incidentally was the second beach cleanup organised by Green Coalition this year. You can view the event pics on the official Take Care Take Charge Facebook community page or the Green Coalition Facebook page.